A stone and bronze vertical dial approximately 10x6 feet just below the roof of the Mack School. Dial face includes Roman numerals showing Eastern Standard Time and a polar gnomon. Inscription appears below gnomon. A well-rusted horizontal dial of iron or steel about 10 inches diameter on a stone and masonry pedestal. Dial face shows Arabic hour numerals but hour line angles may be wrong. Mounted atop a stone and masonry pedestal. This garden analemmatic dial uses plants to mark time with plants selected to demonstrate bio-rhythms by their daily opening and closing at different times. Four-o'clocks are planted at the 4 block. Magic evening primroses 'Tina James' encircle the area. Flowers open in 15 seconds to the sunlight, quite a spectacular sight! Also planted here are: Evening Primroses, Portulaca 'Sundial', Coreopsis 'Sunray', Morning Glory, Thyme, Four-O'clock, and Moonvine. Children cast their shadow to tell the time. Step between the blocks of the current month, raise your right hand, and your shadow tells the time. The analemmatic dial is set up for daylight saving time. 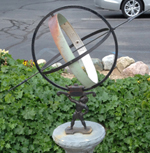 This monument sundial is an Erickson equatorial polar dial 6 feet in diameter made of light granite with a 3 inch steel rod as gnomon. Time is graduated by hour, half-hour, quarter hours and 5 minute marks over 24 hours. Noon is at the bottom, matching the 105 degree meridian. Designed to be read from the upper surface in Spring/Summer, from the under side in Fall/Winter. Unlike other Erickson dials, the Equation of Time plaque is presented in a circular arc on the ground. Photographs courtesy David Wright, Director, Frankenmuth Parks & Recreation. A bronze equatorial dial approximately 6 feet high with bowstring gnomon. Hour markings show Daylight Saving Time and are longitude corrected. Dial sits atop a brick plinth. A cast iron statue of a small boy painted in gold and kneeling. With arms upright, he holds a plate on top of his head that held the original sundial face, surrounded by an inscription and ornamentation. The statue is bolted to a concrete pedestal. With the original sundial gnomon removed, a new oversized horizontal dial has been carelessly bolted onto the top plate. The gnomon and dial face imply it is a British reproduction, totally unsuited for the Michigan location. The dial face is ornate, with a compass rose in the center, surrounded by a chapter ring divided in 15 minute intervals. A second, outer chapter ring divides time into 5 minute intervals. Time is indicated with Roman numeral hour marks. Dial in good alignment, but illuminated by the sun only during early morning. A four foot high equatorial dial possibly of painted cast aluminum on a four foot high segmented granite pedestal. Hour ring displays Roman numerals for EST with five minute marks with longitude correction. Tiles of pedestal bear names and birth/death dates of those memorialized. A modernistic analemmatic dial. The ellipse is a raised stone wall with large Arabic numbers for each hour from 5am to 7 pm. The concrete patio in front of the wall contains the analemmatic line of months as an indicator of where to stand for casting the shadow. ca 16 in. square Brass Roman Numerals Three stars at south end of gnomon, Roman numerals 5AM-7PM, hour lines with arrow heads. Dial sits atop a tapered white column. Horizontal dial 16 ft in diameter with 6 ft gnomon. 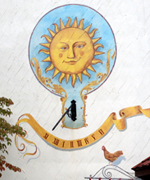 The Sundial is pyramid shaped, painted in four different shades of yellow and white. Two sighting tubes along slanted upper edge. Sundial sits in center of circular concrete base with brick facing. The original horizontal dial and gnomon of 1909 was cast aluminum, very rare for a turn of the century dial, and have been assigned a safe place in history in the EMU archives. 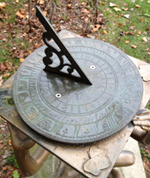 The new sundial face is weathered brass and copper. The sundial is being replaced on campus after a 30 year absence and recent rediscovery. The granite face of the sundial plinth under the metal base has directional lines indicating major cities in Michigan, Ohio, and around the United States. The original 1908 granite pedestal about 4 ft. high is still used. A 10x15 foot vertical wall dial. On a stucco wall, the dial is tile with an aluminum gnomon. This dial atop Sherzer observatory is scheduled for repainting and renumbering. A new and larger brass gnomon is in the works as well. The newer campus landmark is visible from as far away as Wasahtenaw Avenue.